I have to be honest, this book bored me up until Sam speaks of joining Van Halen. I really didn't care about how he earned his first ten cents, how he met neighbours to jam with, and his idiotic girlfriend who would later become his first wife. I just didn't care. Why? Because I'm a Van Halen fan. Of course, Sam has had nothing to do recently in the way of big-time fame. It's clear in the book he blames the Van Halen brothers for this, but downplays the original goal to be big and famous to just being happy and having a club band afterall. I could tolerate a lot of the mudslinging because I expected it. I actually got a few laughs reading about 80s/90s Van Halen antics. Not a whole lot I didn't expect from them! 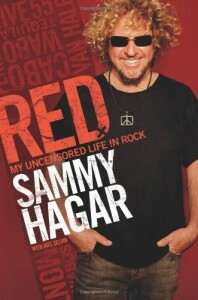 I could be missing the point with how great Sammy Hagar really is, but he really lost me when he was advised the he was just as big as Van Halen on his own than Van Halen themselves, and I wanted to toss the book in the garbage. Luckily, I kept reading to enjoy the Van Halen stories. I thought, "Who am I reading about here? Gene Simmons? A self-proclaimed god of rock who doesn't need anyone?" If you're a Van Halen fan, and love the brothers as much as I do, you will take the book with a grain of salt and just realize that Sammy wrote a book while the guys are actually going to build another album and tour. It's clear when you see interviews of the guys on youtube that obviously someone doesn't have their history clear. Though Sam is quick to attack Eddie's vulnerable side with drug and drink, it just doesn't seem like that long ago, he was more than grateful to join Van Halen, encourage the crazy behaviour and live up that great rock n' roll life he always wanted, only to criticize it in the book. Sammy was a great voice for Van Halen for a time, but there are definitely two sides to this story, and I would like nothing more than Ed and Al to write a book of their own to set the record straight.